The Aztec Empire was one of the most power empires in the Central Mexican region which ruled the region during the 13th, 14th and the starting decades of the 16th centuries. The empire was established by the Mexica people who migrated from north and established their capital in Central Mexican region. The empire eventually saw its downfall upon the arrival of the Spanish conquistador Hernan Cortes who conquered their capital city and destroyed it. For formal Aztec history and timeline, 1325 can be taken as the starting point because it was this year when the Aztecs established their capital Tenochtitlan on the swampy grounds of Lake Texcoco. It was not an ideal location but their motivation was based on a religious legend. The city-state came into clash with the neighbouring city-states with the passage of time and eventually it became the most powerful city in the region. Thus came the period of Aztec Empire which was established in 1428 after a civil war. The Aztec Empire was finally overthrown in 1521 at the hands of the Spanish conquistador Hernan Cortes. It is hard to trace the origins of the Mexica people who formed the Aztec Empire. It is known that they migrated from the north several centuries before the empire was established and some have suggested that the Nahua people, who later became the Aztecs, began to migrate into the Mesoamerican region from the 6th century onwards. According to Aztec legend, their place of origin was called Aztlan but its location is unknown. According to some experts, this was a region of Southwestern United States while others place it in the north of the Mexico Valley. In the Aztec history, the famous Triple Alliance has particular relevance because it was thanks to this alliance that Aztec Empire was established in 1428. Before the formation of the alliance, Azcapotzalco was the most powerful city-state in the region. However, when their emperor Chimalpopoca was assassinated, the civil war of succession began which soon spread to other city-states. 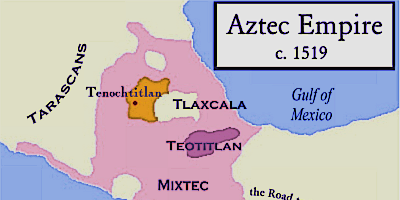 During this war, a triple alliance was formed between the city-states of Tenochtitlan, Texcoco, and Tlacopan. 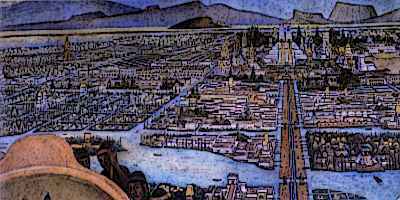 This alliance defeated Azcapotzalco and Tenochtitlan emerged as the most powerful city-state and the capital of the Aztec Empire. Itzcoatl was the first emperor in Aztec history after the formation of the Aztec Empire. His rule extended from 1427 until his death in 1440. He made important contributions in laying down the foundations of the Aztec Empire. He constantly increased the power of Tenochtitlan by subduing the neighbouring city-states and also developed laws of the new empire. Additionally, he constructed temples, roads, and causeways along with an impressive religious and governmental hierarchy. 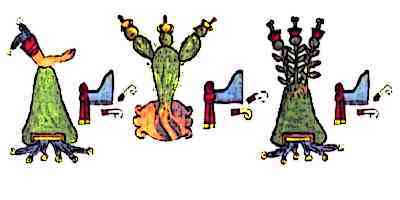 Itzcoatl was succeeded by Moctezuma I who was assisted by Tlacaelel who acted as his trusted assistant. While Itzcoatl laid down the foundations of the Aztec Empire, it was during the reign of Moctezuma I and Tlacaelel, which extended from 1440 to 1469, that most of the ideological framework of the empire was established. Emperor Moctezuma I also continued the expansion of the empire while Tlacaelel strengthened the ideological basis of the empire by such concepts as Aztecs being the chosen people. 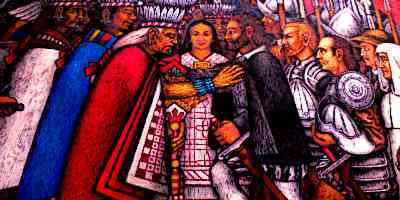 Tlacaelel was also one of the primary architects of the triple alliance during the civil war. He remained close to subsequent emperors in Aztec history, in particular Moctezuma I. Other than establishing the concept of Aztecs being the chosen people, Tlacaelel also elevated the Aztec tribal god, Huitzilopochtli, as the most powerful god in the pantheon. He also increased militarism in the empire and promoted the concept of human sacrifice. Additionally, he strengthened the nobility and established the Aztec social hierarchy. Moctezuma I was followed by Axayacatl who ruled from 1469 till 1481 and Tizoc who ruled from 1481 till 1486 respectively. Various other city-states including Tlatelolco, Mazahua, Matlatzinca, and others were conquered during their reigns. But they constantly had to subdue revolts in the empire and conquer the city-states who had rebelled. 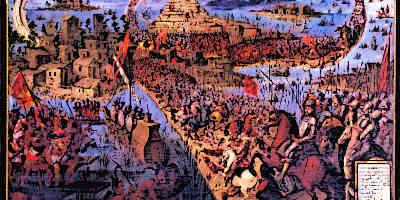 In was also during the reign of Axayactl that the Aztecs faced their first major defeat in 1479 at the hands of Purepechas. Tizoc was succeeded by Moztecuma II who continued the expansion of the empire and consolidation of the tribute system. He expanded the empire toward the south as far as Tapachula in the Soconusco region. It was at this point in the Aztec history when the Aztec Empire was at its largest extent. Further expansion of the empire was to be halted by internal strife and the arrival of the Spaniards. The downfall of the Aztec Empire was primarily due to the arrival of the Spanish conquistadors. This happened in 1521 when the Spanish conquistador Hernan Cortes, after a long siege, conquered the city and destroyed it completely. The city was further to be built on new foundations and with new structure. One of the most important reasons of Aztec downfall, other than lack of military technology, was the European epidemics which wiped out large part of the population. After conquering and destroying the capital of the Aztec Empire, Tenochtitlan, the Spaniards built it upon new foundations. The Aztec history under the Spanish rule did not undergo extreme changes. The nobility of the empire under the Spanish rule was initially considered as such, although not equal to the nobility of Spain. The upper classes of the Aztecs also learned Spanish and this helped in the creation of Aztec literature and poetry since they did not have a fully developed written script of their own. Many Spaniards, on the other hand, learned the Aztec culture and wrote about it. Aztec history has its beginning in the migration of the Mexica people from north who established their city-state, Tenochtitlan, on the swampy grounds of Lake Texcoco in 1325. They went on to establish the Aztec Empire under Emperor Itzcoatl. The empire continued to be expanded during the reign of the subsequent emperors and developed sophisticated ideological, social and political structure. The empire was eventually defeated and destroyed by Spanish conquistador, Hernan Cortes, who then built their capital city on new foundations under the Spanish rule.